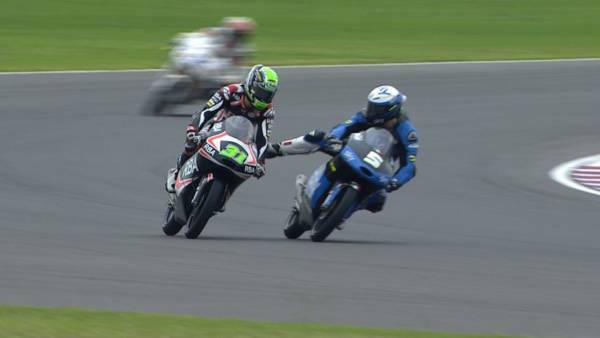 At the recent Moto3 race held in Argentina, Italian racer Romano Fenati displayed a burst of hot temper and un-sportsmanlike conduct towards another rider that garnered him three penalty points. The incident happened during the morning warm-up when Fenati, for reasons yet unknown, kicked out at Finnish rider Niklas Ajo. As you can see in the video, Ajo remained calm during the incident, and chose not to return the favor. Then at the end of the warm-ups, Fenati, still furious, switched Ajo’s bike off as the latter prepared to make a practice start. 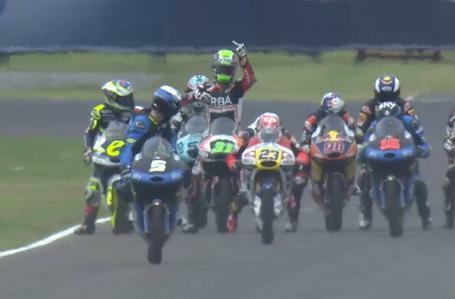 As Fenati and the other riders rode off, Ajo’s reaction can only be described by the gloved middle finger he held up to the disappearing rider. “We will also try to improve at psychological level to check impulsiveness. It was a false step we paid dearly, but the bike was okay and I managed to push hard and fight back and I am very happy about it. We have a good basis on which to build on ahead of Jerez,” the Italian added. UPDATE: It seems like Dorna has disabled embedding for their video. Watch it on YouTube here.